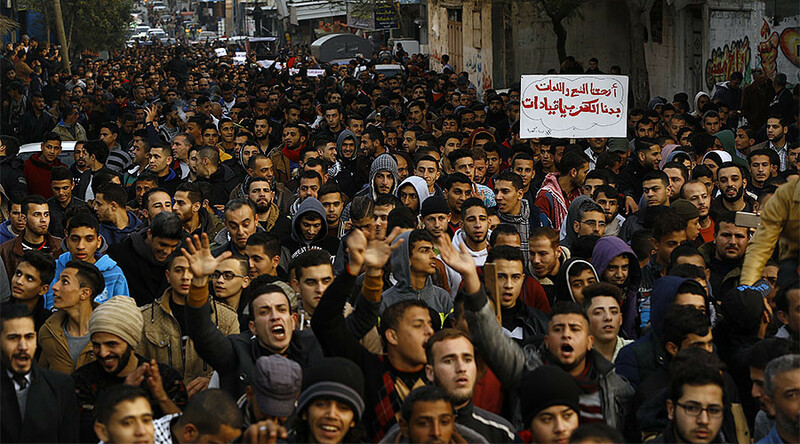 A demonstration protesting electricity cuts in Gaza attended by several thousand people was broken up by Hamas before the crowd could reach the electric company. Gazans have had just a few hours of electricity a day for months, with blame laid all around. The energy crisis hit the Gaza Strip late last year, worsening an already dire situation. Locals there were used to getting electricity in eight hour cycles, but they have now been reduced to just three or four hours. The cost of running generators has also soared, and few people could afford them even before the crisis worsened. On Thursday, anger over power rationing escalated into a protest focused around the Jabaliya refugee camp. The chanting crowd threw stones at police, who fired into the air to disperse the protesters, according to Reuters. Ma’an news agency said security forces also targeted reporters covering the events. The crowd was prevented from reaching a power company, which they blamed for the crisis. The clashes are the latest sign of growing popular discontent among Gazans, who number more than two million. They direct blame at all sides, including Israel, the Palestinian Authority, which controls the West Bank, and Hamas, which runs the Gaza strip – all of which play a role in providing electricity and the ongoing shortage. Gaza has only received 45 percent of the power it requires over the past year and is currently receiving only a third of its daily demand of 450-500 MWs. A power plant in Nusairat generates only 30MW a day, both due to damage it sustained in Israeli bombings in 2006 and a shortage of fuel, which the Palestinian Authority provides. An additional 30MW come from Egypt and 120 MW are supplied by Israel. The PA used to send the fuel it bought from Israel and Egypt to Gaza tax free, but stopped doing so due to its own financial troubles. This has angered Hamas, which has accused the rival faction of undermining the group’s authority in Gaza by exacerbating the crisis. Moreover, Gaza’s electrical utility has been unable to collect payment from many of its customers, and is now owed around $1 billion in unpaid consumer bills. Meanwhile, the Israeli company is demanding that the Palestinian company pay the debt owed to it in full before it will increase supplies. The crisis has worsened since temperatures began falling in winter, increasing demand for electricity. Poorer Gazans have had to switch to candles and firewood for lighting and heating, while those better off have started buying more diesel fuel for generators. This has caused a spike in demand and, consequently, prices that, in turn, has put many local businesses at risk of bankruptcy.